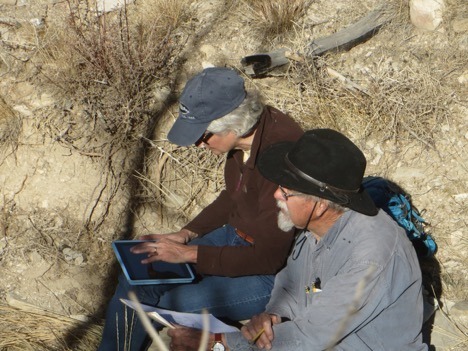 During a search for the contact point of two different Sheep Pass Formation rock units, Amy Henrici uses GPS-linked topographic maps in her iPad to locate the zone referenced in a stratigraphic map held by Richard Hilton. The frog fossil expedition workforce doubled briefly with the arrival of a two-person team affiliated with Sierra College in Rocklin, California. Earth Science professor Richard Hilton and field assistant Tina Campbell drove east from the Sacramento area, crossing the Sierra Nevada and a large portion of the Great Basin to meet us for two days of field work. They then proceeded to another fossil locality in the region to retrieve material discovered during earlier summer field work. The Sheep Pass Formation within the South Egan Wilderness was familiar territory for both. In 2012 and 2013 they participated in larger expeditions to the area that involved not just Carnegie Museum of Natural History and Sierra College, but also the University of Nevada at Las Vegas. Because Hilton is chairmen of Sierra College’s natural history museum, our fireside conversations included the potential for using blog posts to broaden the audience for information about paleontological field work. Through the combination of his generosity, two-burner stove, and culinary skills, camp meals also improved. 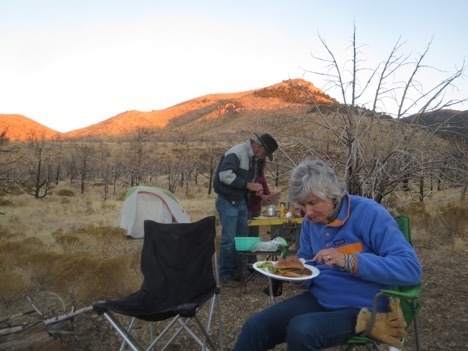 Dinner at dusk, including Caesar salad, baked beans, and hamburgers.